Being independent is every females dream in today’s world. Voylla- a brand for impressive fashion jewelry brings in an excellent opportunity to earn money from home. Cheering the womanhood, the brand is making a prestigious effort to raise the confidence amongst women. Not all would take an effort to coalesce the business objective with the customer’s betterment. Many of the online selling brands considered profit making as their prime motive. But why Voylla supersedes them is it’s thought with which they are trying to nurture confidence in women and introduce ways to make money. A new concept altogether, but seems to hit it right for those who are really fond of fashion and jewelry. 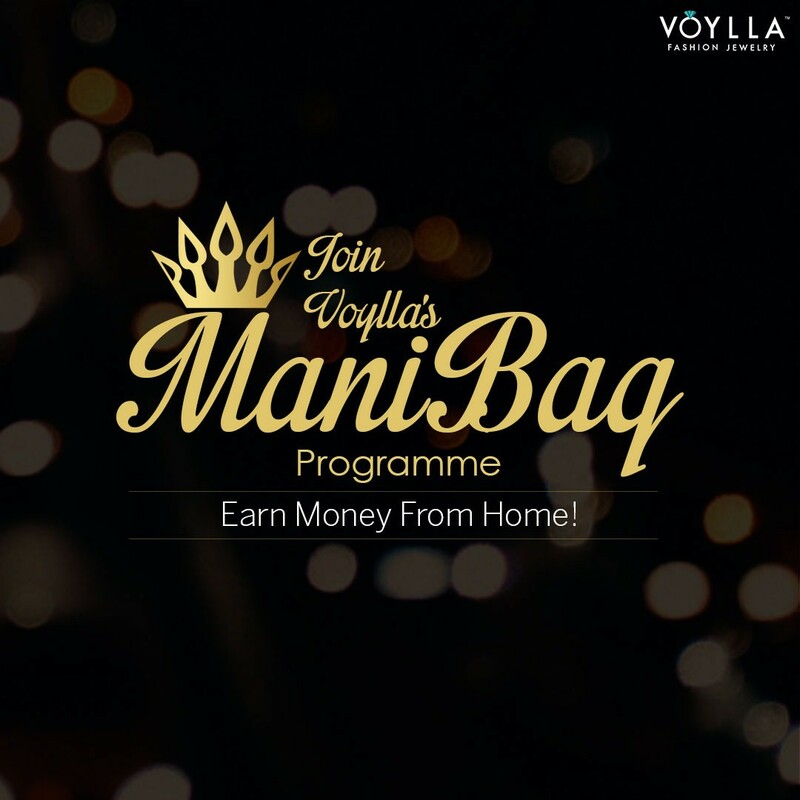 If you are the one who keeps a track on the latest accessories, the Voylla Manibag Program is definitely for you. Here is how you can be independent and know how to make money fast. Be your own boss as soon as possible and earn from home. Follow these simple steps and make quick money online. Step 2: Build your own catalog consisting unique collection of jewelry pieces from Voylla. Step 3: You can pick and add products from suggestions, product. Step 4: Inform your friends and family by sharing with them your catalog . 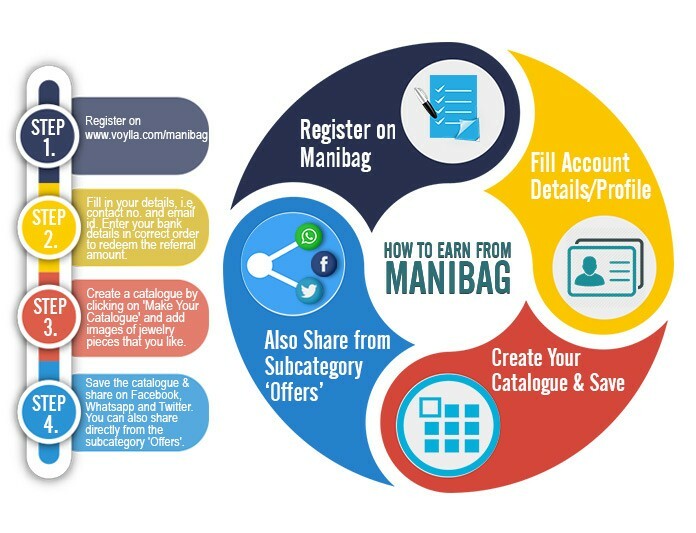 Step 5: You can also earn quickly by sharing your catalog on Whatsapp, Facebook, and Twitter. Step 6: Apart from social media, try and share your catalog directly from the product page and from the offer. Step 7: Help customers shop fashion jewelry in a new and exciting way. Step 8: Get 20% commission every time Voylla comes up with a Sale. Step 9: If you manage to get Rs.1000 in your account, convert into cash easily. You can also get it redeemed against purchase made on the site. Step 10: This amount you earn can be transacted in your Voylla cash in account or it will be transferred to your bank account. Establishing a new channel to connect with the masses, the Voylla does not plan to grow alone. They wish to make the women independent and be a part of their success while even they know how to make money fast. Working to strengthen the women in society, Voylla gives away a goodie by sharing one of the ways to make money online. They have chosen a perfect segment that is close to the women’s heart. When you design your own unique catalog and share it through the social media platform, you are helping many to choose and shop from Voylla. Another yet a new way through which the reach of the clients can be increased. Moreover, creating a catalog enhances your confidence and opens up your mind for the latest trendy fashionable stuff. You can make a different portfolio according to the type of the jewelry. Some of it can be for the casual wear and the rest may completely match the formal attire. Use your sense of designing and shopping online to earn money from home. As much as you sell through your portfolio, Voylla helps you earn in your account. Earning through Voylla account will allow you to monitor the incomes. The web page permits you to update the catalog as soon as they add the new fashionable accessories. Keep your viewers updated and surprise them with your prompt efforts. As the online business gains momentum, both selling and buying,has got easier for businessmen and customers respectively. The best part is that you earn money from home 24 hours a day. As you go online through Voylla, your catalog is always under a scan by the customers. Serving your with one of the easy ways to make money online, Voylla motivates you to make the best striking product catalogue to create an impression and earn money online.